TAMIYA Battery-end Connector Kit. Includes housing + 2 metal bullet pins. Crimping will be required to affix a wire to the pin. This battery end is referred to as the "female" end. TAMIYA Motor end/Charger end connector kit. Includes Housing + 2 metal pins. Some crimping will be required to affix a wire to the metal pin. This TAMIYA motor/charge end is referred to as the "male" connector. KYOSHO female connector housing & 2 metal pins. Also known as mini-Tamiya connector. Size; approx. 1" long x 0.45" across x 0.25" tall. Choose quantity - save $$ on per-unit price ! Micro JST male connector with wire leads. Battery end - goes on small 1S LiPO. Also known as Micro JST 1.25mm. Micro JST female connector with wire leads. This end plugs INTO a small 1S battery. Also known as Micro JST female 1.25mm. Use for charging & adapting. Length with wires is about 4". KYOSHO female connector. Choose quantity. KYOSHO female connector with wire leads. Also knownas "mini Tamiya". Typically used for charging or motor connector. Sometimes on battery for certain RC models, though. XT60 - high-amp connector for RC applications. This is the BATTERY end. Has Gold-plated bullet connections for soldering onto. XT60 motor-charger connector. For high-amp RC use. This end goes on the MOTOR wires or CHARGER wires. 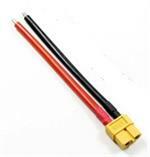 Part # XT60-M.
TAMIYA motor end/Charger end connector with 6" heavy-guage wire leads (black & red). This end typically goes on the motor or Charger. EC3 battery connector : "male" blue housing & 2 gold-plated pins. This end goes on a battery pack. EC3 motor/charger end: High-amp Blue connector housing with 2 gold-plated pins. This end goes on the charger wires or motor wires. Futaba J male RC battery connector with 22awg silicone wire leads. Exclusively produced by BATTERIES AMERICA. Superior quality connectors with 18" long wire, thick-sheathed 22awg silicone wire. Buy in bulk and save more $$ ! JR-HiTEC-SPEkTRUM male RC battery connector with 22awg silicone wire leads. Exclusively produced by BATTERIES AMERICA. Superior quality connectors with 18" long wire, thick-sheathed 22awg silicone wire. Buy in bulk and save more $$ ! XT60 female connector with heavy gauge wires - for motor or charger. You plug an XT60 battery pack INTO this connector. Attach to motor or charger. JR-HiTEC-SPEkTRUM male RC battery connector with 20awg heavy-duty silicone wire leads. Exclusively from BATTERIES AMERICA. Superior quality connectors with 18" long wire, thick-sheathed 20awg silicone wire. Buy in bulk and save more $$ ! Futaba J male RC battery connector with 20awg heavy-duty silicone wire leads. Exclusively from BATTERIES AMERICA. Superior quality connectors with 18" long wire, thick-sheathed 20awg silicone wire. Buy in bulk and save more $$ ! JST male (battery end) kit - 5 housings & 10 pins. $ 2.75 per kit. Choose larger quantities for greater savings! XT60 Charge Cable with Banana Plugs. Use this to connect your XT60 battery pack to a smart charger. Banana plug ends go into most chargers. JSTF-JSTWM: adapter to convert JST red connector to flat white Walkera connector. deans 4-pin red connector set. Set of 2 deans 4-pin mating connectors. Heat-resistant housings & gold-plated contacts. Set = 2 connectors. 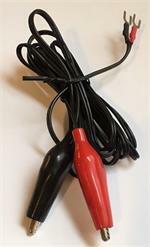 2S-Bal-Ext: Balance charge extension cord for 2S LiPO LiFe batteries. 2S JST white connector at one end, 2S JST-XH mating connector at other end. Handy & often essential for linking LiPO batteries to smart charger. JST SM type Black connector w/ wing clips - fits Wattage Praxus, Magic Machine & more. This connector typically is ON the battery pack. Includes wire leads. MFG part # SMP-02V-BC. Also known as JST SM, JST 2.54. Deans Micro Plugs. 2-pin connectors, mating style (female = battery end, and male = motor/charger end). SET of 2 pcs. Black color. Battery end has 2 prongs for attaching wires. Motor/charge end has 2 prongs on each side of the housing. Taranis Connector: Goes on 7.2-volt Batteries for Taranis RC transmitters. Taranis Charging Connector: Goes on 7.2-volt Batteries for Taranis RC transmitters. Use this Charging connector when you are smart-charging your Taranis transmitter battery externally. 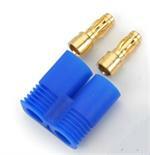 Add Banana Plugs to wire ends for $ 2.50 extra. Alligator Clips with Wires. 72" wire length. "U" lugs at other end. ELCO female: HiTEC ELCO 2-Pin white Tx charging connector. ELCO female: White Charging Connector for HiTEC TX packs. Plug your HiTEC TX pack (the kind with the small square White 2-Pin end) into this Female/Receptacle connector for Custom Charging applications. Includes wire leads. Futaba Tx Charge Plug - Coaxial 5mm x 2.5mm barrel plug with wire leads. Plugs into most Futaba Transmitters. Use with wall charger or smart charger when applicable.